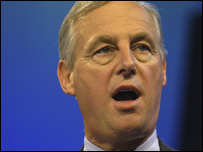 Conservative MP Tim Yeo says he wants to see "virtually no" UK domestic flights within a decade. Mr Yeo, who chairs the House of Commons Environmental Audit Committee, said radical action needed to take place at home before tackling long-haul flights. There has been a ongoing row over emissions caused by politicians' choosing long-haul holiday flights. Mr Yeo told GMTV he now always travelled to Scotland by train "as a matter of conscience". He also insisted there was "no reason at all why people should fly around the UK". He said: "Those flights should be knocked out. "What we should do is tax domestic flights so heavily and use the money to improve the railways so that in five years' time everyone is choosing to go by train within the UK. "That would make a big step in right direction. "The long-haul flights are harder to tackle, but the domestic flights we can be taking action on right now and we should be. "I honestly do believe that within 10 years there should be virtually no domestic flights." Prime Minister Tony Blair has said he would not give up flying, cast doubts on whether any politician would tell people not to fly, and also questioned the impact of UK-only climate action. And Downing Street has said Mr Blair planned to offset emissions from his holiday flights. Mr Yeo also accused the government was being "pretty timid" over the issue of aviation taxation. "There is an opportunity here to show that Britain is really serious about climate change, about carbon emissions, about reducing the amount of flying". He added that if Britain did this, "I think the world would sit up and pay attention and we'd be setting an example that other countries could follow."